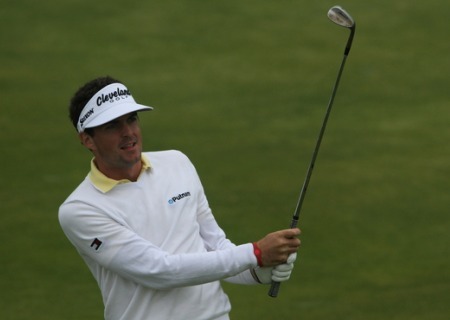 Keegan Bradley was disappointed to miss the cut at Royal Portrush. 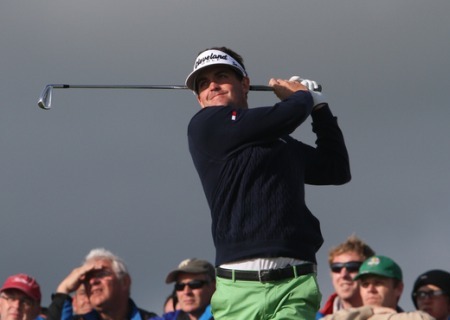 Photo Jenny Matthews/www.golffile.ieKeegan Bradley won’t forget his first taste of links golf in a hurry. The US PGA champion said on the eve of the event that part of him wanted the weather to be foul. But after racking up double bogey sevens with lost balls at the par-five 10th on both days to miss the cut on level par, he’s hoping the experience stands to him in the Open at Royal Lytham next month. Visibly upset after rounds of 73 and 71, Bradley groaned: “I love it up but I wish I could have played a little better. I didn’t play the par-fives well and lost a couple of balls. Bradley is proud of his Irish roots and vowed to come back for another Irish Open despite getting blown off course. Rory McIlroy certainly doesn’t wear the trousers when Caroline Wozniacki is home. The world No 2 headed straight back to Belfast after his second round 69 with a trip to the cinema on the cards. Wozniacki crashed out in the first round at Wimbledon Wednesday but was on the first tee at 7.50am yesterday to stand by her man. John Kelly lost FOUR balls as he crashed out with rounds of 82 and 73. The St Margarets club professional is one of the best drivers of the ball on the Irish circuit. But he struggled off the tee and knew he had no chance of making the weekend. Kelly said: “When the strongest part of your game is off, you’re going to struggle. It was so bad that even with 25,000 people out there I lost four balls. Sky Sports commentator Ewen Murray drew a chuckle from viewers on both sides of the border yesterday. A Sky commentator also referred to his pride at seeing the Union Flag flying on the 18th but they are on the lamp posts on the Dunluce Road outside the club. Just one Union Jack flies over the course - from the mainmast style flagpole in the club car park. Darren Clarke might be from Dungannon but he’s a Portrush man at heart. The Ulsterman proved it with his local knowledge, correctly identifying Ireland’s biggest bunker to the right of the 17th as Big Nellie. The bunker has been called Big Bertha, which is actually at Sandwich, but Clarke knows Portrush’s famous trap is named after a roly-poly former club cook. 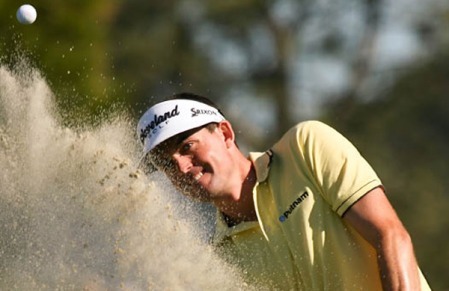 Keegan Bradley played his first round of links golf on Tuesday. hoto Jenny Matthews/www.golffile.ieKeegan Bradley quickly discovered the secret to beating jet lag on his first pro visit to Ireland - a drop of the hard stuff. Rory McIlroy was disappointed with his finish but pleased with his overall game. Picture Fran Caffrey www.newsfile.ieRory McIlroy is banking on fan power to roar him back into contention at Royal Portrush.